We have already discussed how investing works. Now we’ll drill down and continue with this guide and explain stock market investing. Specifically, I’m going to point out how you can avoid fatal stock market mistakes that can ruin your retirement. After that, we’ll look at mutual fund investing. We’ll finish by looking at the main ways people invest in the market and help you determine which investing method fits you best. Many people are intimidated by investing in the stock market because they don’t understand the basics. In fairness to them, that fear could be well founded. Plenty of people make stock market mistakes which torpedo their retirement and they want to avoid making those costly errors. Well, if that describes you, we’re about to solve that problem once and for all. To understand the stock market think about any other market and you’ll be a master. In markets, people who have stuff to sell “meet” with people who want to buy and they trade with each other. That’s it. And that’s exactly how the stock market works today. It’s also how it got started several hundred years ago. In the late 1700’s business owners who wanted to expand their business put up notices in downtown Manhattan – on Wall Street and Broadway. Entrepreneurs who needed money to grow their business back then would pin up advertisements and offers on trees. If someone was interested in investing they would contact the business owners who were looking for investors and negotiate the deal. Usually, this resulted in those investors owning a piece of the overall business. That was the formula then and it hasn’t changed very much since. When you own stocks you become a part owner of the company. When you buy a mutual fund that buys many stocks, you become a part owner of many companies. Why do some people say that stocks are good investments for the long run? This is THE key question when it comes to stocks. And to fully understand the answer, let’s look at the S&P 500 index. Why? Because this index is a compilation of 500 of the largest companies in the United States (and the world) and is considered a proxy for the entire market. For most people, changes in the index are a non-event. For people who invest in narrowly based sectors, the impact could be huge. But it’s an important wake-up call for everyone. I’ll explain. Most investors think of the S&P 500 as a static investment. But this move shows it isn’t anything of the kind. Therein lies the big take away from changes in the S&P. If you take a step back, you’ll see that this demonstrates the importance of paying attention to the market and change holdings accordingly. That’s what the people at Standard and Poors do every year and that’s why I think it’s important for you to do as well. As the market reality shifts, update your portfolio. We’ll get into that latter in great detail. Not to worry. On any given day, some of these stocks in the index go up and others go down in price. The combined result is the performance of the index and is one of the most widely followed numbers by investors. They use that performance over varied time frames to get a sense of how the market is doing. You’ll see why this is important shortly. Who decides which companies are included in the S&P 500 Index? S&P stands for Standard and Poors – a private company. This is the firm that created the index and they decide which companies are included in the index and which are not. They select the companies based on a number of factors. These companies are drawn from either the NYSE or NASDAQ market exchanges. Usually changes are made the index each year as I already explained. Some new companies are added to the index while others are taken out. This is very important because in effect, the S&P is constantly changing. How Have The Stocks That Make Up The Index Performed? This indicates that over long periods of time, the S&P 500 has done a good job of helping investors accumulate wealth in the past. Of course, it’s no guarantee of future results. Why has the value of these companies gone up over time? There are many reasons. But mainly, stock prices move over the long-term because of the company’s earnings. Over time, if a business earns greater profits, it is worth more because it has the potential to pay out dividends or invest further to earn still greater profits. If profits rise, the business will be worth more and if the business value grows so will its share price. Let’s take an example. Let’s say you start a painting company and in year one, your profit was $25,000. If your neighbor offered to buy your company for $50,000 you might sell. But what if you don’t sell. And what if your profit skyrockets to $100,0oo the following year? Would you sell for $50,000 then? Of course not. You’d want at least $200,000 and maybe quite a bit more. That’s because the future looks bright and you might prefer to hold on to the company and profit $100,000 this year (and hopefully more next year) rather than sell out at $200,000 and be out of the picture. So you see, as earnings rise, so does the value of the company. If that company is traded on the stock exchange, you’ll see the shares go up over time as earnings go up. This doesn’t happen immediately or in lock-step. But over time, stock values rise with company earnings. Keep in mind that the opposite is also true. If earnings fall, the value of the company and its shares usually fall as well. There is one very important caveat to emphasize; earnings drive stock prices over the long-run but not necessarily over the short-run as I mentioned before. Over a short period of time, the market is ruled by emotions – mostly fear and greed. Real earnings may have nothing to do with short term prices. Perceptions are everything for the short-run. If, for various reasons, people are frightened and anxious about the future, share prices could fall. This can and does happen even to companies that are doing well and have strong and growing profits. If the market (buyers and sellers) think that hard times are ahead and that it will be more difficult for companies to grow the profits, they will rush the exits to get out of their shares and many will be willing to sell at lower and lower prices. And just to give you a sense of how unimportant short-term stock prices can be, consider extreme changes that happen on a daily basis. Can share prices rise or fall by 10% in one day? Of course. It happens all the time and sometimes prices rise or fall by much more than 10% in one day. But do you really think the value of the company changes that much in 24 hours? It can happen of course. But usually it doesn’t. When something really surprises investors such as the Brexit vote outcome in 2016, global markets immediately took a dive because people were caught off guard. That was an emotional reaction. But within a couple of weeks, world-wide markets stabilized because investors realized nothing had really changed at that point. Over the short-term, what changes is perceptions and that’s what fuels daily price movements – not value. To be fair, perceptions can change in response to real events. That’s true. But it’s usually the emotional reaction to those events which move stocks – not the events themselves. And that’s why investing over the short-run is typically more risky than long-term investing. Over the short-term, it’s all about emotions. Over the long-run, it’s all about earnings. Assuming you understand what I shared above, you don’t have serious debt, you have an adequate emergency fund, you can save money each month, you can stomach the ups and downs of the market and you have at least a 5 to 10 year investment time horizon, there is probably a case for investing at least a part of your money in the stock market. Can you give me some investing tips? When Facebook went public, I got interested in investing but I wasn’t able to buy shares. That worked out OK but I don’t understand why the stock has done so poorly. How should I get started? Should I buy stocks? Should I get a broker or a discount broker and trade online? Should I go back and buy Facebook now? If not, when? And how much should I invest? I don’t know about you but when I read this email I felt dizzy. Pat’s mind was racing 1000 miles an hour. I’m certain that at least half of the questions Pat asked were planted in his mind by various talking heads in the media. That’s why he’s all over the map. First, commit to a process. It feels like Pat is clutching at straws here. Maybe I’m reading too much between the lines but if feels like he is looking for a way to make a fast buck. I never endorse this approach to investing. This is like the person who wants to lose weight and jumps on a new diet/exercise program every other week. Can such a person actually expect success? No. And the same thing can be said about becoming a successful investor. Slow down. Understand you have to go through a process to hone your investment skills. This is going to take time. You can also master these topics (and more) by studying the investing guides I’ve prepared on this site. My advice is not to do anything unless and until you have a clear understanding of each of these investment alternatives – at the very least. Again, start slow. You are going to make mistakes and you can’t beat yourself up when you do. You will learn more from doing (and making mistakes) than by reading and talking. Do your homework and start small. But before you go off and start, it’s a good idea to define what investment success looks like to you. You may think that it’s easy to know if you are making profitable investments ; if you make money, the investments are successful. If they lose money they are not profitable investments. Right? If you determine that the only way your investments are successful is if you make money each and every month, the only investment alternatives available to you are bank CDs. With interest rates for one-year bank deposits coming in about 1% (before taxes and inflation) it will be difficult to reach your financial goals even though your investments are “successful” (according to your primary directive and definition). This is just an interesting twist on the theme of “winning the battle and losing the war”. Clearly, defining investment success as never losing money (the flip side of always making money) is a non-starter. So the first question you must ask yourself when you define a profitable investment is, over what time frame? And the problem here is that if your time frame is long, you have to make decisions today about a future you are uncertain about. Let’s say you decide that investing in the bank is for the birds and that you want to grow your money relatively safely for the long run. You decide to invest in a balanced mutual fund. You want to know if your strategy is successful so you compare your performance to that of the overall market or S&P 500 index. You do a little investigation and learn that your fund earned 10% while the overall market was up 15%. Should you conclude that your mutual fund performance was stinky? Not really. You invested in a balanced fund which has both equity and fixed income investments in the mix. You invested in that fund because you didn’t want all the risk of having all your money in a growth portfolio of stocks. How can you come back now and compare your performance to an all-equity index? You really can’t if you want to make a fair conclusion. If your long-term goals are to grow your money safely so you don’t have to worry about your future, you have to evaluate your performance over a very long time. Mark Hulbert is a noted follower of investment strategies. In January of 2012 he noted (in his Market Watch column) that the only way to accurately evaluate a growth strategy is to examine it over at least 15 years. That is not to say that you must hold a fund for that period of time. Mr. Hulbert is saying that you should evaluate your investment approach over that time period. Forget the track record of the last year or two. What has your approach done over the last 15 years? You might have an approach that selects funds based on current performance or you might be a buy and hold investor. Whichever way you go, just make sure you evaluate the approach over (at least) 15 years. Look for proof that your approach has done a good job of weathering a variety of market conditions and the only way to do that is to look at a very long-term track record. Again, we’ll look carefully at investment approaches in other guides. You’ve heard the expression that you can’t predict the stock market. Over the long run, the market has gone up but that’s no guarantee so you can feel comfortable that the odds might be on your side, but you can’t predict. When it comes to short-term market changes, forget about it. The reason is because over the short-term, the market moves all over the place based purely on emotional reasons that are impossible to understand fully. And it gets more complicated. As smart as I think I am sometimes, the reality is nobody knows what really moves the market at any one time. Of course, that doesn’t stop people from trying. And even if you do “get it right” and figure out what’s going to happen in the market, your “clairvoyance” may actually cost you a lot of money over the long-term. I’ll explain that in a bit. When we try to predict the stock market and make decisions based on what we come up with we are no longer investors. We become speculators instead. You might think you know what’s going to happen but when you sit back and consider the situation logically, you know you don’t. Don’t get me wrong, if you choose to speculate, that’s fine. Just remember that speculating isn’t investing. Investing ignores the short-term noise. Speculating thrives on it. If you try to forecast how certain news events will impact the future as it relates to the stock market you are a speculator as I explained above. There are no two ways about it. For example, the person who could “see the financial crisis coming” in 2008 should have “seen it going away” in 2009. Not many people saw both. I met many people who “got it right” and pulled out of the market in 2008 and avoided the financial crisis. The only thing is, they kept their money out of the market far too long and ended up losing more than had they invested and rode through the decline. If you speculate on the market getting out, you are obliged to speculate on getting back in. Not many people are consistently good at that. So this issue forces us to decide what kind of investors we want to be. If you are a long-term investor, you have to accept short-term volatility in exchange for having a good shot at long-term success. If you are a speculator you get to react to short term events. This will feel better but it can end up costing you a lot of money. This doesn’t mean you have to invest blindly or buy and hold your positions forever if you are not a speculator. You can use different strategies that are market-sensitive. That means you invest when the market is strong and refrain from investing when the market is weak. Like everything else, it’s not perfect. But such systems may help you avoid catastrophic results. And because this is long term and system based, it’s not speculation. If you are a speculator, that’s fine. Just have realistic expectations. There will be times when you’ll get it wrong. That goes with the territory. And when you get it wrong it will cost you. If you can’t accept that, don’t speculate. Many experts say that more money has been lost anticipating the next bear market than has been lost when the market actually fell. As you can see the market rewarded investors just when it looked like the end of all things financial. Of course this is just one example – but it’s an important one. 2008 – 2009 was an extreme situation too. But extreme situations are those most likely to push investors to their limits and that’s why they are so dangerous. Am I suggesting you should ignore what’s happening in the investment world or that you should always invest when the headlines turn south? Not at all Mon Ami. Headlines and news stories are important but not nearly as important as your overall investment approach. Personally, I follow the market and look for technical signs of strength or weakness and allow that data to inform my decisions. The news and headlines are not part of that equation. You may follow an approach like that or use another method. Whatever system you rely on to make investments please don’t allow news stories and headlines to overpower and commandeer your investment strategy. This goes for good and bad news alike. Don’t allow your fear or your greed to take over the mother ship. If you do, chances are good your landing won’t be pretty. Should Investors Stop Investing During Wars? When war breaks out it is of course a catastrophe for humanity. And when something that bad happens, it may feel better to sit on the side-lines as an investor. You are probably feeling terrible for all the people who are suffering and dying. And beyond that, you probably have a little financial fear as well. How is this war going to impact your own financial future? With things so bad, who wants to invest? I understand those sentiments. But the question is does it make sense to shut down as an investor when the world seems to be falling apart? We can’t predict the future of course. But we can look at the past and see how the market did in times of war. Did it make sense to refrain from investing during times of military conflict in the past? I looked into this myself and the answer surprised me. Here’s a graph that plots a few major conflicts and how many people died on a chart of the S&P 500 in the recent past. Of course this is no guarantee of future results and you can’t really invest directly in the S&P 500. But none-the-less, the graph tells a pretty interesting story. As you can see, past military conflicts were terrible in human cost. But they didn’t necessarily doom the market. Quite the contrary. The market actually did pretty well once military operations began. That conclusion may seem counter-intuitive to you. It did to me. That’s why I did more research. I found a unique study done by some well-regarded European academicians who did their own research. They wanted to understand how the threat of war impacted markets vs what effect actual war had. They looked at large military conflicts dating back to World War II. The looked at how the market performed leading up war and how the market did once the war started. They concluded that the prospect of war usually led to stock market declines. But they also found that once war actually broke out, the market tended to do pretty well. This is not to say that war is good or that every military conflict leads to prosperity. But I think it’s fair to say that war doesn’t always spell disaster for investors. Other forces are far more important. I explained above how it’s impossible to predict the market over the short-term and how many times just when you think the market is about to take a deep dive, it actually does pretty well. But there are times when the market dips, drops and plummets. This is a fact of life and in order to understand how to make money in the market, you simply must understand the concept of market losses. This way, when the market takes a dive, it won’t catch you by surprise and you’ll know what to do. To get started, please look carefully at the picture of the bell curve above. It is the key to understanding why most people lose money investing. The good news is that once you understand this picture it can help you avoid making catastrophic investment mistakes. Don’t worry. This isn’t a statistics lesson. But even if it were, you know a lot more about statistics than you think. In fact you draw these bell curves all the time…at least in your mind. But you may not be doing it correctly. Let’s say you are considering making an investment in a hypothetical mutual fund. You look at the fund performance over many years and there is plenty to like. You find that over the last 20 years, it had a number of great years. And you perk up even more when you see that it returned a profit of 30% or more several times. At the same time you notice some bad news. During the worst years investors lost 30% or more. That also happened a number of times. That being the case, you could draw a bell curve like the one I created above. If you did draw that bell curve it would accurately describe the past performance of this hypothetical fund. Most of the returns fall between +30% and -30%. And if you were a statistics freakazoid, you could conclude that if you buy this fund, your returns will fall between +30% and -30% 95% of the time. If you did come to such a conclusion, you’d be right. But even though you are right, there is still a problem. The problem is that you’ve failed to consider the other 5% chance of an outlying event occurring otherwise known as “the tail”. Sure you acknowledge that there is a 2 1/2% chance of something really great or really awful happening intellectually. But in your heart, you dismiss it. “It won’t happen to me” is what you tell yourself. Of course, the 2 1/2% to the right of +30% is wonderful. It represents those years when the return exceeds 30%. According to our bell curve, that’s going to happen 2 1/2% of the time. But 2 1/2% of the time, the performance will be much worse than -30%. Yikes! 2008 was one of those years. Need I say more? The reality is that these “bad surprises” are a possibility and nobody can predict how “bad” they might be or when they might occur. The very big problem is that some people make the mistake of forgetting about the extremes as I mentioned above. Others think that once the extremes happen, those extreme returns are the new norm. Both of these conclusions are flawed, dangerous and expensive. If the market tanks and you decide to never invest again, you’ll be selling low and forgoing any potential for future growth. You also potentially jeopardize your financial future and retirement. Ouch. When your investment returns fall into the right tail, it’s equally as dangerous to expect those sky-high returns to repeat themselves year after year. You might chase return without considering risk. Some day that chicken will come home to roost and you’ll be the one who gets cooked. 1. Be clear on your financial situation and time horizon. Create a portfolio allocation based on your real time horizon. Say you are 57 years old and you want your money to last until you reach 85 years of age. What is your time horizon? It’s 28 years. Even if you get clobbered with a terrible market, it may not mean that much in your overall plan. Don’t make the mistake of changing your time horizon when things get difficult and uncomfortable. That usually works out to be a very costly mistake. Acknowledge worst-case scenarios and be willing to accept them or use an investment strategy with less risk. 2. Use the right asset allocation to reduce risk. It’s very dangerous to take on more risk when things are good and suddenly become very conservative when things are bad. Select a portfolio allocation that will pass the “sleep at night” test in tough situations. This will allow you to stay invested longer. 3. Understand that things may not work out as you planned. If you get caught in the wrong side of “the tail” too soon or too long, your plans may not work. The chances of this happening are low – but they are there. But be careful not to be too pessimistic. If you build your whole investment strategy as if the worst will happen, you’ll be ignoring the other 97 1/2% chance that things will be much better. That’s like staying inside all day because of the slight chance you might get hit by a bus. Is it possible? Yes. Is it likely? No. Don’t get me wrong. I believe that you can and should use an investment strategy that recognizes risk and adjusts your portfolio accordingly. But no matter what you do, there is no guarantee that it will work. 4. Beware of your confirmation bias. Confirmation bias is a very important concept – especially for investors. It is the tendency you and I have to look for proof that we are right rather than look for the truth even if that means we are wrong. Along the same lines, that same bias leads us to downplay information if it is counter to what we already believe is right. On the face of it, this may seem like a pretty natural thing to do. The problem is that because we are confirmation biased, we tend to ignore competing truths that might help us make smarter investment decisions. Here’s an example outside the financial realm. Let’s say you happen to be a libertarian. You’re going to read what other libertarians write. You will talk to other libertarians and listen to other libertarians as much as you can. This is fine except that once in a while a conservative or liberal person might have a better idea you hadn’t considered. This shuts you off from the potential to learn and grow and maybe take a different (better) course of action. This concept is at work of course no matter what your political views are. If this phenomenon only related to politics it would be bad enough but confirmation bias also extends to how we invest. And if you want to make smarter investments, it’s crucial that you isolate that problem a.s.a.p. Let’s say you are convinced that the price of gold is going to the moon this year. If you allow that opinion to influence your research, you’ll ignore any contrary opinion or facts and gather as much support for your notion as possible. That could be a very expensive error. What happens to people under the spell of confirmation bias is that they don’t see when the tide has changed. They are so stuck with their own beliefs that there is basically nothing you could show them or say to them to help them get a balanced view. How expensive could this problem be? I met a man a few years ago who was convinced that the government was going to take his 401k and nationalize all retirement accounts. I have no idea where that stroke of genius came from but he was absolutely convinced this would be our fate. What did he do? Despite all the proof I laid at his feet to the contrary, the man took all his money out of his retirement accounts to keep it “safe” . Meanwhile he incurred a huge income tax penalty as a result of this move and lost the ability to take advantage of continued tax deferral for the many years ahead. He used to be a doofus. Not he’s a broke doofus. Doh! Are you suffering from confirmation bias? Of course I can’t tell you but I can share a study done by the American Psychological Association a few years ago. They concluded that people look for information that confirms what they already believe to be true twice as much as they look for information contrary to what they already to believe to be true. In other words, it’s highly likely that you and everyone you know suffer from this problem. Admit that this phenomenon is real and examine your own behavior. Make sure that when you do your research, you aren’t just looking for facts that support your existing opinion. Go out of your way to look for opposing views. Actively try to find some value and truth in ideas you generally disregard. Ask yourself, “what if I’m wrong?” “What would someone with a different opinion think about this?” “What would they say?” And if all else fails, talk to your investment mentor. If you want to make sure you are making smart investments please look for the opposing view and thoroughly consider the opposite opinion. With that said, let’s look at two different types of market losing situations; the correction and the bear market. Experts refer to certain stock market declines as “corrections”. But what exactly are corrections and what is the difference between a correction, pullback and bear market? Glad you asked. When the S&P 500 index declines 10% to 20%, it’s known as a market correction. If the market drops less than 10% it’s called a pullback. And if the market falls more than 20% it’s labeled a bear market. What do these terms have in common? And what should you do about it? Experienced investors know that dips and drops are par for the course. If you put money in the market you have to be ready for tough periods. But just how often do these hiccups happen? Market research firm Birinyi Associates of Westport, Conn did the digging and came up with the data. They found that between 1962 and 2011, the S&P 500 shed 20% or more on 9 occasions. That’s just about once every 5 plus years. During that same period, the market fell into a correction (losing 10% to 20%) 16 times – or once every three years. And even during good years, the market has its rough spots. On average, the market drops a little over 7.5% during the year even when the market ends in positive territory for the year. Read this again. Print it out. Memorize it. Paste on it on your fridge. It’s really important. It’s crucial that you understand that investing entails risk. I believe this data can help you and I gain better perspective on our investing. I’ll get to that shortly. But I don’t think it makes sense to have a fixed response to “pullbacks”, another for “corrections” and yet another for “bear markets”. The labels the pundits ascribe to market movement isn’t that helpful. What difference is there between a 19% “correction” and a 20% “bear market”? Not much. And a 2% loss is very different from a 9% loss. Why are they both are called “pullbacks”? So the first thing I suggest you do is forget about terminology – it won’t help you make more money or protect your account any better – but remember that the market hits big bumps all the time. And that doesn’t mean you should not invest. What can help you as I said above is to have perspective. You can either hold through these difficult periods or use a market sensitive approach to try to minimize the damage. Either way, there is no guarantee of better results. The buy and hold approach works well for some people and for not for others. A smart market rotation style can be great but it’s not foolproof. Using any particular approach you probably won’t beat the buy and hold investors every year. If you look at the S&P 500 you can plainly see that it has a history full of pullbacks, corrections and a few bear markets as well. None-the-less, long term investors who are able to stick with it, have done nicely. This is no guarantee of future results but it helps maintain perspective. Corrections happen all the time. We might be in one now. Or it might start tomorrow. It’s impossible to predict friend. Instead of trying to become a fortune teller, pick an investment strategy you feel comfortable with and stick with it. If you are a buy and hold investor, don’t get spooked. If you shift your positions as the current market changes, rely on your system to adjust your holdings. The one thing I strongly caution you against is to react emotionally to a pullback, correction or even a bear market. While we’re on the subject, let’s talk a bit more about bear markets. A bear market describes a very unpleasant situation during which stock prices decline over a painfully long period of time. According to the pundits, a “Secular Bear Market” is measured in years – not days, weeks or months. A “cyclical bear market” is much shorter. While the long term trend of the market is up, bear markets rear their ugly heads periodically. And when they do, they are costly and agonizing. By definition, whenever the index drops by 20% or more, it’s described as a bear market. But it can be a lot worse. 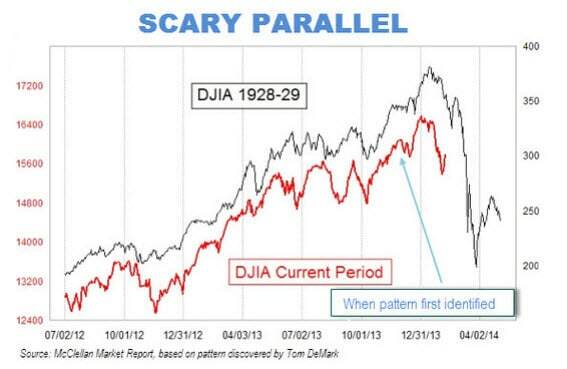 During the granddaddy of all bear markets, the Great Depression of the 1930s, the market dropped 90%. Aye Chihuahua! Historically the market does poorly in anticipation of a weakening economy. So if GDP is slowing and inflation and unemployment are going up a bear might be coming your way. If you watch these numbers over several quarters and see things going in the wrong direction, it could mean big trouble ahead. Bear markets rarely happen as a result of one specific event but occur as a result of general and widespread weakening economy. Are you puzzled by what to do with your investments right now? Feel free to ask me your questions. I’ll be glad to help if I can. Bear markets are easy to spot in hindsight but exceptionally tricky to identify real time. Remember, when some stock market genius tells you we are currently in a bear market, that’s just his or her opinion. Let’s look at a few examples to illustrate. Here’s a chart of the S&P 500 courtesy of Yahoo! Finance. It depicts market performance from 2007 through 2009. The economy wasn’t just slowing at that time – it stopped. GDP turned negative in 2007 and 2008 and we lost 9 million jobs during that period. Although inflation wasn’t a problem, the United States clearly was in a steep and harsh recession. * The market lost more than 50% almost overnight. But were we in a bear market? Take a look at the next chart and you tell me. As you can see, when the situation was most bleak, the market started doing really well. 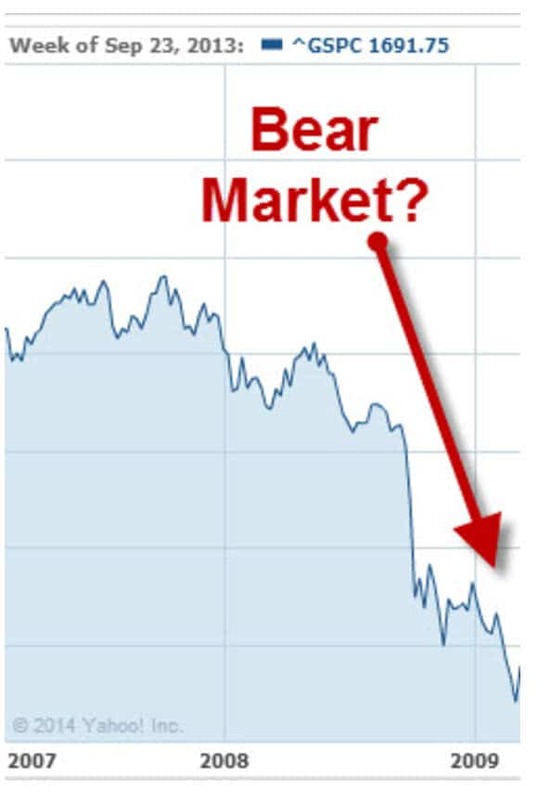 Had you concluded that we were indeed in a bear market in 2008, you might have taken your marbles and gone home. Of course, that would have been a huge mistake. The market did nothing but make money for investors over the following 4 years. That shows you the real danger in declaring a bear (or bull for that matter). Again, you can absolutely describe a historical situation with these terms but you can’t possibly do so while you are in the thick of it. As I said earlier, experts and the media are terrible at helping us make good investment decisions. When you first see this, what is your reaction? Is it fear? If so, you aren’t alone. Lots of people got the wits scared out of them when they first saw this graph. But was it true or helpful? As it turned out, no. The market returned 11.14% in 2014. And 2015 was a little bit below break even. In other words, the parallel that the “experts” tried to draw was all smoke and mirrors. And by the way, the folks who put that visual together used different scales to match up the graphics. If the patterns had been drawn to scale they would look nothing like each other. See for yourself. And even if the patterns were to scale, it wouldn’t mean a thing. The conditions that resulted in the Crash of 1929 are very different from the conditions today. Even if you didn’t see the naughty little graph, you can learn a lot by observing your own reactions when you first see this suggestion that doomsday is just around the bend. It’s only natural to be frightened once in a while if you are an investor. In fact, that was the intent of the people who finagled this data. They did it in order to kidnap your attention and sell advertising. The problem is that some folks might be swayed by their fear and make investment moves they will later regret. Don’t fall into this trap. Yes, the stock market is frightening at times. The short-term future is unknown and unknowable. But if you believe that (which I hope you do) you must also accept that a graph can’t accurately predict the future either. Just because some geek knows how to manipulate data on an excel spreadsheet doesn’t mean he or she knows a thing about the market. Stick to a good investment method instead. Make sure you measure your risk tolerance and then allocate accordingly. You’ll be far better off in the long-run. In my opinion, you should not alter your investment approach just because somebody tells you we are in a bear market. If you are a buy and hold investor (which I do not recommend), you should probably hold on and suffer through. What I would prefer you do is have a strategy that adjusts your portfolio to a more defensive position as the market shifts. If you reallocate your assets and reposition them based on market strength and weakness you will already be actively repositioning your investments long before the pundits make a bear declaration. What I am trying to say is that your investment strategy should be numbers-based and guide to make changes to your holdings long before a talking head declares a bear or bull market. The numbers should speak louder than words Pilgrim. If they don’t, you’ve got a dangerous investment strategy. The goal of investing in stocks is to grow your wealth over time. So why have we spent so much time talking about losing money? Well, for starters, we’ve seen that in any one year (and often longer) the market can drop. The first conclusion is therefore is not to invest short-term money in the stock market. Also, if you are have high cost credit card debt, don’t invest. Instead, get rid of that debt first because you get a high guaranteed “return” in the interest that you save. If you don’t have any emergency money set aside and you run into a sudden, unexpected need for cash, you’ll have to sell your investments. If that happens at a bad time and the market is weak, you could be forced to sell at losses. That’s why you should first set up an appropriate emergency fund before investing. And that’s not all. You must have the emotional fortitude to stick with your investment strategy through thick and thin to be a good investor as well. That’s why I pounded home the issue of risk and loss. Many people aren’t able to do that. And what happens is that they react emotionally when the market takes a tumble and cash out at often the very worst times. We’ll talk about how to overcome this problem in just a bit. JP Morgan did a study and found that for the 20 year period ending 2014, most investors underperformed the market significantly for this exact reason – they reacted emotional to the market and failed to let the ups and downs even out over time. Marketwatch did their own digging into this issue and made similar conclusions. In the JP Morgan study, the average investor earned only 2.5% per year over this time period while a balanced fund made up of stocks and bonds grew by more than 8%. Why the difference? Because individuals often pull the plug at the exact wrong times as a result of fear. This is not to say that if you hold on for 5 or more years you are guaranteed a great return. There are no promises. There have been many long stretches of time with little or no return in the market. In order to make money in the market, the longer you invest and the longer you stick with the right strategy, the better your chances are. Now that we’ve studied the dangers and what to do about them, let’s get busy and learn about making money in the market. When people invest in the stock market they either do so by purchasing individual stocks or funds. There are other ways to invest. But by far, these are the two most prominent. When you buy individual stocks you are making a (relatively) large bet on one company. When you buy a mutual fund your theoretical risks are dispersed. That’s because of the diversity mutual funds and ETFs offered as I explained above. A fund often owns hundreds or thousands of different stocks. So, if you buy stock in one company, you might invest $100 and buy 10 shares of XYZ stock for $10 each. But instead, if you buy 10 shares of AAA Mutual fund at $10 each you might own a little part of 500 different company’s stocks held in that fund. That means you have a lot less risk (relatively speaking) with funds as opposed to stocks. Besides risk, cost is also something to consider when you are trying to decide between stocks and funds. When you buy an individual stock you might pay a commission when you buy and when you sell the stock but that’s about it. As you’ll see in the section on “where to buy stocks and funds” that cost is usually minimal. But with individual stocks, you won’t pay any additional fees unless you hire a money manager to manage the stocks for you. But when you buy a fund or ETF, you incur additional costs. You might have to pay a commission when you buy or sell as well. But even if you don’t, you will still have to pay ongoing management expenses. Depending on the fund you buy, you could pay as little as .07% per year or as much as 3% per year. For a full understanding, you need to read through the particular fund’s prospectus. Why do funds charge ongoing fees? Well, first because the fund company wants to make a profit. Without collecting money from the investors, they can’t make that profit. They have to charge you in order to stay in business. Second, funds have expenses associated with managing money. For one thing, they have an investment committee which decides which stocks to buy and which to sell. The investment committee takes the burden of making investment decisions off of your shoulders which is great, but they have to be paid. That’s why funds charge fees. Some funds are managed very actively; they buy and sell frequently. That frequent trading costs money so they generally charge higher fees. Those funds that are more passive and trade less typically charge lower fees. Do funds make more money than stocks? This is a question I get asked all the time and it’s hard to answer because it depends on which funds and which stocks you are talking about. If you are good at picking stocks and enjoy it, you will likely make more money with individual stocks. However, it’s important to keep in mind that with individual stocks you have to do your own research. Also, keep in mind that if you go this route, you should plan for an ongoing time commitment to manage your stocks. That’s because things change. You may not want to buy a stock and hold on to it forever. Stocks that are doing well today could go south tomorrow. That’s why it’s critical to have a strategy to manage your stock portfolio that tells when to buy and when to sell rather than simply buying stocks that are popular at any one time and holding on to them forever. The bottom line is that many people find it more efficient and less risky to buy stock funds or ETFs rather than individual stocks. Which mutual funds are best? The answer to this question depends on your investment style and strategy. Also, keep in mind that all mutual funds are not alike. There are bond funds, stock funds, international stock funds, large cap funds, small cap funds, value funds, growth funds etc. The list goes on and on. To make matters more complicated, there are passive funds and active funds as I hinted at above. Passive funds buy stocks held in an index (like the S&P 500) and hold on to those stocks until the index itself makes changes. (That usually happens about once a year). Actively managed funds trade stocks much more frequently as I mentioned above. Now that you have a solid understanding of how the stock market works, it’s time to deeper your understanding about mutual funds. After that we’ll look at ETFs and individual stocks. Then, we’ll put it all together by developing the right investment strategy that fits your needs Keep in mind that I don’t know your unique situation or risk tolerance. That’s why this guide is going to provide general guidelines for you. Before you implement these ideas I strongly suggest you speak with your financial advisor. One question regarding the Return Model vs the S&P, does the return continue to hold if you have to pay taxes in a high tax state like CA? Living here, all of my investments in taxable accounts are in stock funds and held forever because I don’t want to give Uncle Sam or Uncle Jerry (Brown) my money (Does not include emergency fund in laddered CD’s).